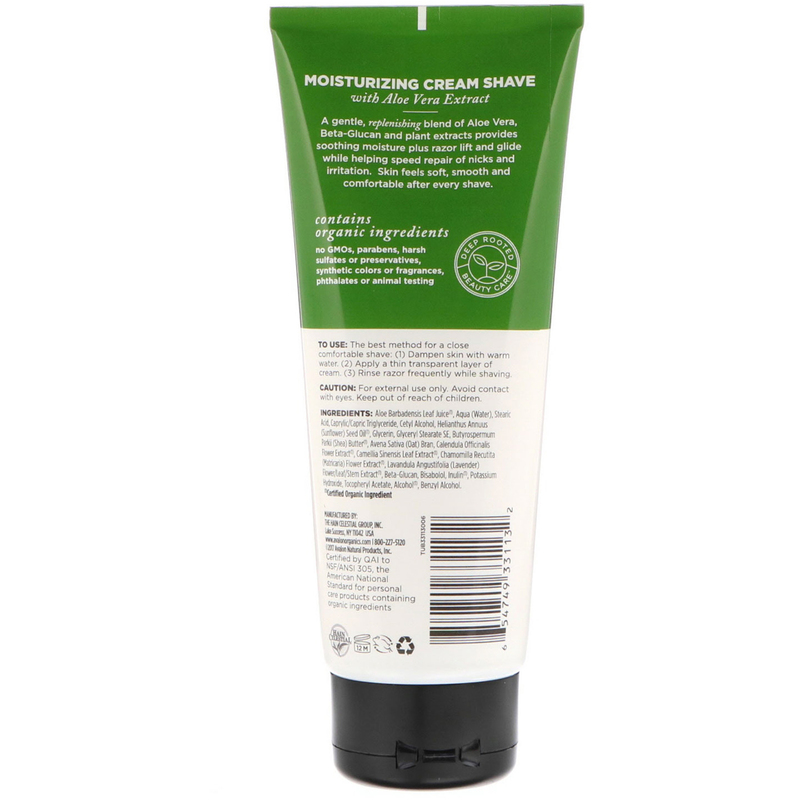 A gentle, replenishing blend of Aloe Vera, Beta-Glucan and plant extracts provides soothing moisture plus razor lift and glide while helping speed repair of nicks and irritation. Skin feels soft, smooth and comfortable after every shave. Dampen skin with warm water. Apply a thin transparent layer of cream. Rinse razor frequently while shaving. Aloe barbadensis leaf juice¹, aqua (water), stearic acid, caprylic/capric triglyceride, cetyl alcohol, helianthus annuus (sunflower) seed oil¹, glycerin, glyceryl stearate se, butyrospermum parkii (shea) butter¹, avena sativa (oat) bran, calendula officinalis flower extract¹, camellia sinensis (oat) bran, chamomilla recutita (matricaria) flower extract¹, lavandula angustifolia (lavender) flower/leaf/stem extract¹, beta-glucan, bisabolol, inulin¹, potassium hydroxide, tocopheryl acetate, alcohol¹, benzyl alcohol. Contains organic ingredients: no GMOs, parabens, harsh sulfates or preservatives, synthetic colors or fragrances, phthalates or animal testing.